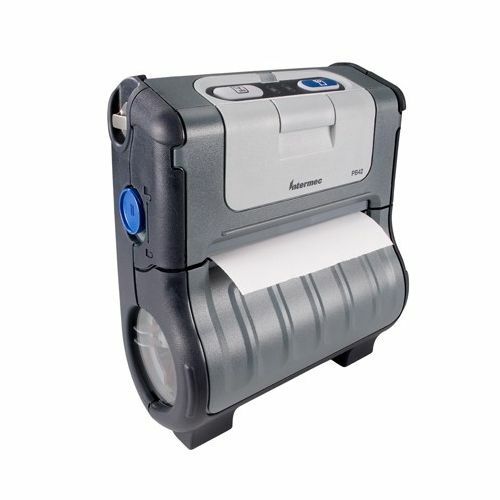 The PB42 Rugged Receipt Printer is a four-inch mobile printer designed to improve direct store delivery (DSD), field service and home-utility applications. PB42 printers interface seamlessly with CK60 and 700 series Honeywell mobile computers. Daily route activities are easily entered and tracked via mobile computer throughout a worker’s shift. Receipts are immediately provided to the customer for prompt payment, and to eliminate duplicate billing efforts. The PB42 printer’s unique design ensures ease of use. Design features include a shared battery design with CK60 mobile computers, simple receipt-paper installation, high-visibility buttons, and indicators to show when the printer is within radio range or when the lithium-ion batteries need to be replaced. Charge up to four printers at once with the optional four-bay charger. Printers “drop-in” and charge from hinge pins – no charge cable required. Frontloading batteries can be removed with just one hand. For further convenience, a Lexan® media window conveniently shows media status. And to ensure user comfort, a standard belt clip and hand strap add to the ease of operation. The PB42 mobile printer is ideal for use worldwide, featuring widely recognized international logo indicators on the buttons, multiple language character sets, and worldwide certifications.